The story started long before the American Society of Clinical Oncologists gathered in Chicago. It started four years earlier inTexas and Arizona and 153 different locations where patients, always sick, sometimes dying would swallow a single small pill every day. They were regularly driven from their homes to their local medical center to get pricked and poked, examined and sent back home to hope for the best. In the whole history of myelofibrosis hope was in very short supply. And then word leaked out. At first there was only a rumor of success and then the appearance of scientific abstracts, recruitment announcements for new clinical trials. Finally, last month, the story exploded across the Internet . There is a treatment for myelofibrosis. Where once there was nothing, now there will be something. At the acute, devastating end of the myeloproliferative spectrum, MF usually means shortened life expectancy with some intense suffering along the way. As the marrow becomes fibrous and shuts down, blood production moves to new areas. A bloated spleen, thick with new and stored blood, restricts patient movement and appetite, a flood of poorly understood proteins often causes intense itching, bone pain, anemia, night sweats and mind-numbing fatigue. At advanced stages, those suffering from myelofibrosis begin the process of cachexis, a wasting away syndrome of lost weight, lost muscle mass, and apathy. Eventually, some patients progress to acute myeloid leukemia but the usual cause of death is the crushing effect of myelofibrosis itself. There is no approved therapy and only limited symptomatic relief. The only cure for MF is a risky stem cell transplant and that option is only open to the relatively young and healthy. There were some signs that hope was on the way. In 2010, the prestigious New England Journal of Medicine published a report on those 153 patients. They had been taking a drug called INCB018424. The study was supported by Incyte Corporation and managed jointly by M.D. Anderson’s Srdan Verstovsek, the report’s lead author and Mayo Clinic’s Ruben Mesa. It was a dose escalation study of yet another JAK inhibitor. But this time the results of the 14 month study were extraordinary – reduction of spleen volume by an average of over one-third and a 50% overall improvement of myelofibrosis symptom scores. An open study like this may be promising but it doesn’t prove much to the United States F ood and Drug Administration that approves new drugs based on hard data derived from rigidly controlled clinical trial. The stage was set. Incyte made the mega-million dollar decision to support two large scale Phase III clinical trials, one in theUnited States, one in Europe. These were the COMFORT (Controlled MyeloFibrosis study with Oral JAK inhibitor Treatment) trials. COMFORT I, the American trial, ended up accruing 309 patients. COMFORT II, inEurope, 219 patients. Two basic questions would now be answered with scientific clarity. How effective is the drug – now called Ruxolitinib 424 — when matched against a placebo in a blind study? ( In a blind study patients are divided into two groups, each receiving identical looking pills, neither group knowing whether its pill contains the medication or not.) The other question: How effective is the drug compared to the Best Available Therapies, the so-called BAT drugs. Some quantitative criteria were set up. How much would the spleen shrink, how well would the drug group compare with the placebo or BAT group in reduction of symptoms according to the Myelofibrosis Symptom Assessment Scale. With that, the trial, lasting a little under a year, began. 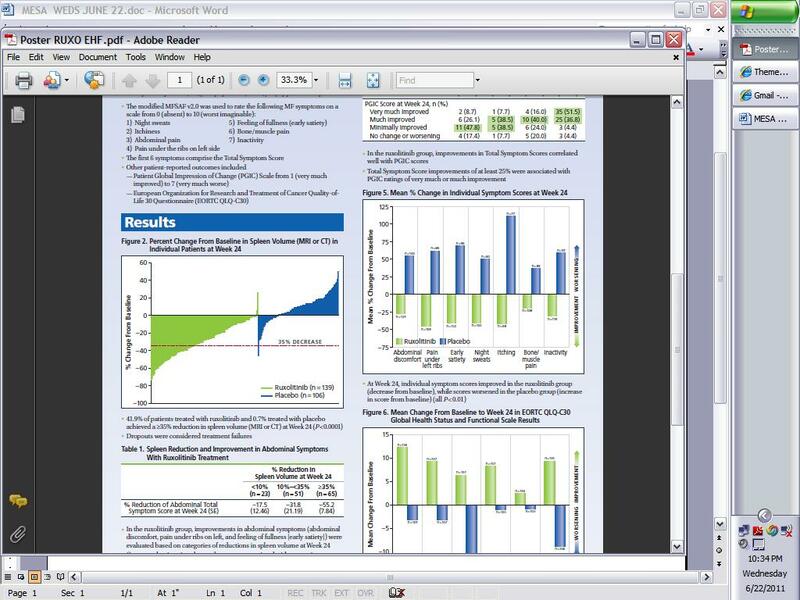 The results formally announced in Chicago at the ASCO conference the first week of June, 2011, were unequivocal. Ruxolitinib was able to stall the rampaging JAK clones, shrink the spleen, and dramatically improve symptoms of myelofibrosis. Incyte filed a New Drug Application with the FDA and asked for fast track approval. It is possible Ruxolitinib will be available for Christmas. But Christmas came early for most patients in COMFORT I and II, many of whom started their trial near death and completed it with a new lease on life.. Both COMFORT trials enrolled high risk MF patients (309 in theUS, 219 inEurope) divided into two arms. In theUS, one arm received Ruxo, 15mg or 20mg depending on platelet levels, the other was essentially untreated, receiving only a placebo. Despite the design differences, results were generally similar. The results were similar although not so overwhelming in the European version of the trial, reported by Dr. Alessandro Vannucchi of theUniversityofFlorence. 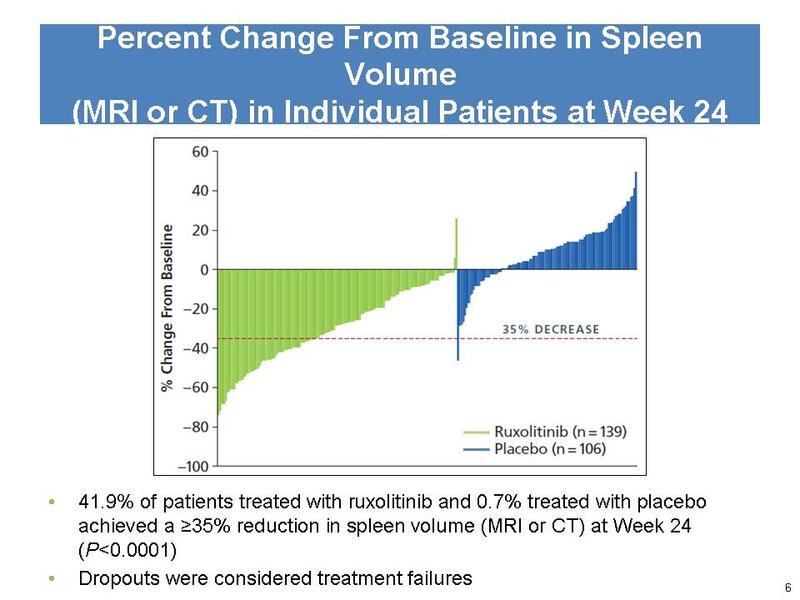 While none on the BAT arm of the trial experienced reduction of spleen volume, 28% of patients receiving Ruxo did reach the 35% target reduction. Reduction of severe symptoms and improvement of quality of life was reported by 31.9% of Ruxo participants and none of those on the BAT arm of the trial. In both COMFORT I and COMFORT II, results were achieved regardless of JAK2 mutation status. ` As we go more deeply into this Special Report — and provide supporting data, links and charts to clip and share with our hematologists – the dimensions of this achievement become clearer. Along with celebration, however, there are sobering elements to this astounding success. There are those who didn’t survive, there are failures along the way, side effects to consider and a long road ahead before myelofibrosis can be said to be under control. Ruxolitinib can reduce spleen volumes. Everyone on Ruxo got some reduction and some saw complete recovery of normal spleen volumes. Four out of 10 MF patients who took it in the US saw their spleen reduce by more than a third in volume. In Europe, a little better than one out of four patients got those results..
Splenomegaly is not only one result of marrow failure, it is itself responsible for many life-altering symptoms: inability to eat or breathe normally, exercise, sleep or fulfil other normal daily functions. With Ruxo, nearly half of all patients reported a 50% improvement in symptoms and improvement of quality of life, Then there are those on the placebo or BAT arms taking alternative drugs or none at all. They showed no reduction in spleen size and worsened overall condition. That’s us, MF patients in the pre-Ruxo world.
. Generally, JAK2 inhibition is no longer seen as a potential cure for MF but rather one of several approaches that might be taken to attack what is a complex blood cancer. Ruxolitinib, however, did not set out to inhibit the mutant clone but impacted a much broader swath of territory. Why invest big bucks in MF anyhow? In the carefully calibrated dance between Business and Science, patients with myeloproliferative neoplasms stand as poor relations, spectators at a festival honoring major diseases and blockbuster drugs. And among the MPNs, those who are last in line, least numerous and most in need, are those with high risk advanced myelofibrosis. Clinical trials are expensive. We were told the numbers aren’t made public – “We haven’t given this sort of guidance in the past…” Drug companies are not compelled to tell us how they arrived at the enormous sums claimed necessary to bring a new drug to market. Seriously, who is going to spend $800 million to serve a patient population of a few thousand in the US when insurance might not cover the prescription anyhow? As MF patients, hat in hand, we can be grateful for any product promising symptomatic relief. But, considering our small numbers and the huge required investment, it is reasonable to wonder at the corporate strategy that would put so much capital in play when there are competing products in the pipeline, and several promising genetic therapies being explored. While there might be 18,000 MF patients in the United States– and only a subset of those would be advanced enough to qualify for Ruxo therapy — there are over 1.5 million people with rheumatoid arthritis and another 5 million with such related rheumatoid diseases as fibromyalgia and gout in the States. The worldwide market is orders of magnitude larger. So it’s not about us. Corporate strategists might be sympathetic to the plight of victims of advanced MF but they’re also after much bigger fish and we’re just swimming in the same pond. In a very strange way, we just lucked out. To have a shot at the RA market, Incyte needed capital, partners, product development, and recognition. In the course of proving its bio-engineering and drug marketing capabilities, Ruxolitinib helped bring all that about. For some, it is all about us. For front line hematologists, scientists in clinical practice who specialize in the MPNs, and those who further devote their lives to research and the care of myelofibrosis patients, we are the bottom line. And they are both relieved and excited about Ruxolitinib. Will Ruxo succeed as a frontline therapy for MF and other MPNs? Clinical trial results and efficacy in the field are necessary but not sufficient to assure Ruxolitinib of success. The jury will remain out on that one beyond the anticipated December FDA approval date. There are unknown marketing and scientific pitfalls ahead, long-term studies of survival and durability of response that will building on on-going data from the trials. And then there’s the issue of acceptance of the drug in clinical practice and insurance reimbursements. Finally, although Ruxo has a good headstart, there’s real competition just over the horizon. 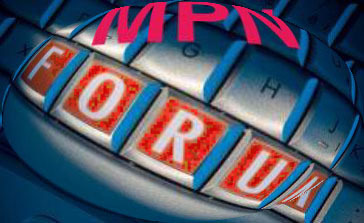 As MPN/MF patients we don’t have many options. We can only wait to see how this part of the amazing Ruxolitinib story plays out. The men and women who worked on the development and testing of this drug already have an achievement beyond the balance sheet. The history of myeloproliferative disease will credit them with creating not an oral JAK inhibitor drug but the first effective therapy for advanced myelofibrosis. With any luck at all, we too will be part of that history.